Basically, kids spend all day outside, poking around the forest, rain or shine. The curriculum's all nature-based. The class goes inside, too, when necessary, but mostly, it's all sticks and mud and animals and whatnot. They're also called forest kindergartens. There's at least one Waldkind inspired school in the US now, which is run by a Waldorf school in Lake Oswego, Oregon. They have kindergarten and pre-school on a farm. I'd be interested to see a city version of this, which would still have the benefit of letting kids be outdoors most of the time, but which would probably sound like heresy to the stream-fording crowd. 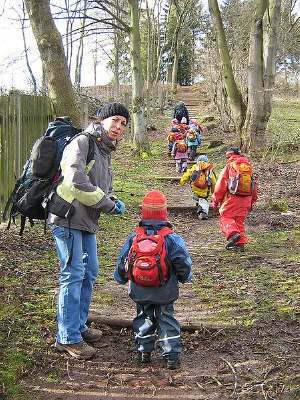 update from the comments on just what I was wondering about: "The daughter of a friend [who is in waldkindergarten] now refuses to use the toilet at home and goes out in the family's garden whenever necessary...."
"German outdoor kindergarten concept called Waldkinder [wild child. seriously.]" No, forest child. Seriously. Wild in German is still "wild" (but pronounced more like "wilt"). If your kid visits a Waldkindergarten (Forest Kindergarten is the literal translation) you should consider that they are out in the woods all day long and take a leak just behind the next tree available. Problem starts when they visit someone living in a city flat. The sad irony of this place is that it has become so damn trendy that all the preschoolers are arriving there in Hummers and Escalades every morning. We're planning the 5-year birthday today, and while discussing activities for the party-goers my husband cracked "Well, they're all Montessori kids - we could just have them clean the house." I am so pleased to see that the idea of Forest Kindergartens and Outdoor Preschools are finally starting to catch on here in the U.S. Our non-profit nature school is the only school offering this option in Washington state at the moment. We welcome others to explore this wonderful way to teach our young children! Yes, there is so much to learn and experience from Ranginui (sky father), and Papatuanuku (mother nature) as we say here in Aotearoa (New Zealand). I have been reading your article in the 'Space' magazine issue 18, Summer 2009/10 with must interest and I'm thinking it would be great to take advantage of our existing outdoor area and giving it a more nature feel. Thanks for the great read. The staff of Matariki Early Childhood Centre.